It's been awhile since I've gotten hands-on with first level marketing and first of all, I'm finding it fun, frustrating, and far-from frivolous. Furthermore, for no real foundational reason, I'm become fixated on the letter "F". Far out. OK, that's enough. The metaphor that I use to understand Twitter is that it's a bit like radio. If you want to make a splash, you think about putting up a Twitter campaign with Tweets going out regularly, many of which are repetitive or mild variations on the same. And most of us don't really want to login and tweet many times a day so there are Twitter add-ons that allow you to schedule them. Two leaders that I've heard about are http://www.hootsuite.com and http://www.bufferapp.com. I'd heard that bufferapp was superior in that it allowed the embedding of images (not just the linking to them) so I signed up for Buffer. Initial reaction to Buffer was fantastic. Slick modern UI and marketing which I found inspiring. In fact, I sent some of their welcome emails to my staff saying that we could take a lesson from his writing and graphical style. I thought this was a pretty great free service and I wondered about how they would handle their effort to get me into their premium service, a business issue that we wrestle with daily. Pretty quickly, I ran into a Buffer usage constraint. I could only put 10 tweets into my queue which, at four a day, means that I have to login ever two and a half days to put new tweets into my queue. So I put in my credit card and upgraded to their paid service. $10/month. When I back into the service, I found that my queue was still only 10 deep. I logged out, logged back in. Still just 10. Switched browsers to see if it was stuck in my cache somewhere. Still 10. OK, not a simple bug, maybe that's the policy. I found their question section and asked them how much I have to pay to get more than 10 items in my queue. The feedback process wasn't great. When you submit the feedback, there's one somewhat unnecessary item that I guess is an effort by them to do their triage from them. It's pictured on the left. A pulldown in which you rate the urgency of your query. The problem is that it's too cute, not clear. I can tell what emergency means, it's high priority. But how does that compare to being stuck where nothing works? After studying it for awhile, I decided that it was a hierarchy and that the least urgent was the top one and the most urgent was the bottom one. But, I'm a believer in the "Don't Make Me Think" school of UI design and in this last, Not Urgent to Most Urgent would have served me better. Worse, I didn't really get an answer. I did get an email, perhaps unrelated, that said that if I signed up for their affiliate program and someone actually signed up and paid them, I could get an extra item in my queue. That really pissed me. Awesome Plan. Which I think what I signed up for at $10 a month. 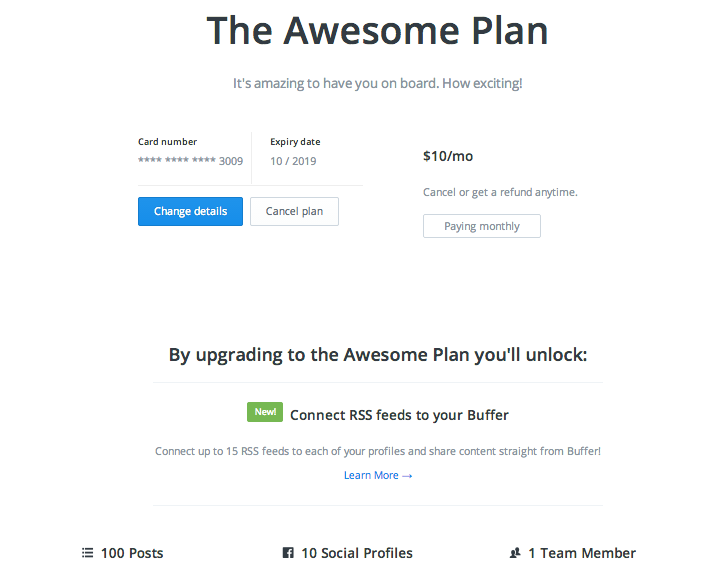 But then, on this page, it looks like they are marketing a higher end plan called the Awesome Plan which has a queue of 100. This is what I want. But now I can't seem to figure out how much changing from my current plan, the unnamed plan, to the Awesome plan will cost. I've clicked around at some length and found lots of info on the benefits of the Awesome plan but no direct answer to the new monthly cost. They keep directing me to a page that has three business plans which have all sorts of features in terms of number of users and unlimited accounts (see below) but I really can't seem to find any answer to the question of how to up my own queue to the 100 on this Awesome plan. GRRRRR. But, I do sort of have an answer. For $50 a month, I can have an unlimited queue and all sorts of other stuff that I don't care about. 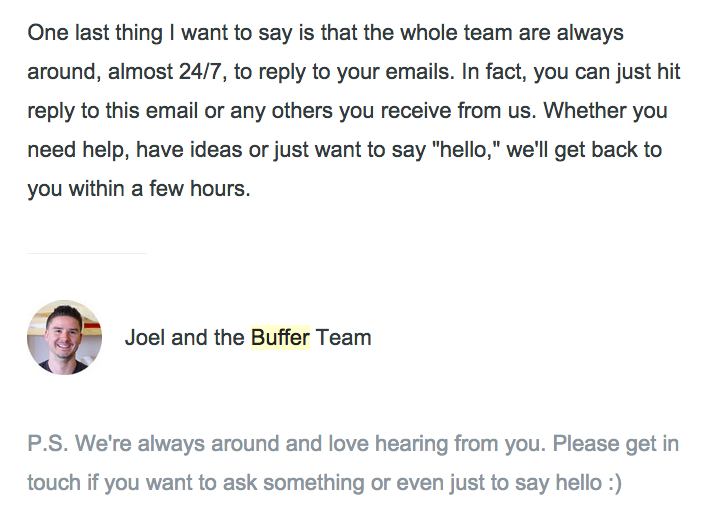 In any case, I've sent the Buffer people another feedback and we'll see if I can get an answer. 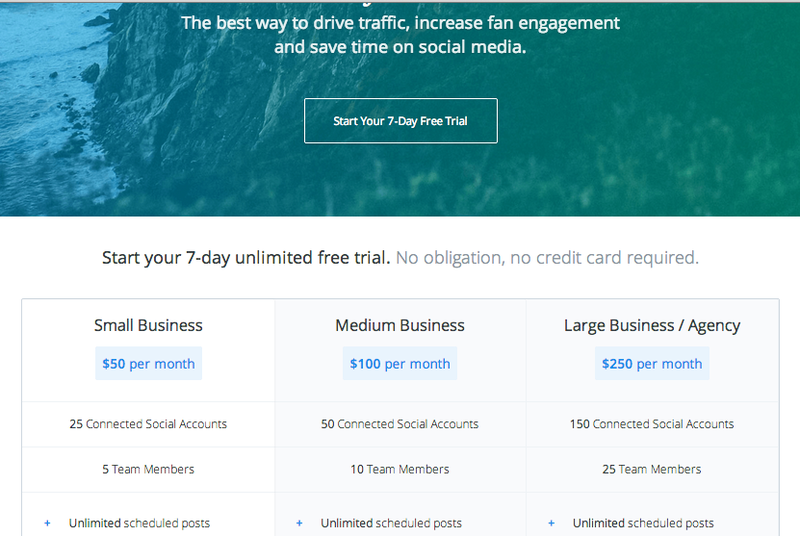 @buffer Reviewed emails from Buffer. Nothing but standard autoresponder. Checked Spam folder. Bingo! Found email from Adam. TX 4 Follow up. I was just using my buffer account and it seems to have more room in the queue. I just filled it up to 15. Many they upgraded me or maybe the switch to the $10 plan provided more space. I still don't understand it.